Can differences in education quality explain the geographic variation in intergenerational income mobility in the United States? Summary of: Inequality of Educational Opportunity? Schools as Mediators of the Intergenerational Transmission of Income. Rothstein, J. (2018). Journal of Labor Economics. Not all children have access to equal opportunities. Children with wealthy parents are much more likely to grow up to be wealthy than children with poor parents. Measuring this intergenerational transmission of income, or the relationship between the incomes of parents and children, is an important metric of inequality. A closer tie between intergenerational incomes means greater inequality of opportunity for children. Across the US, economic mobility is declining, but inequality of opportunity varies significantly throughout the country. In certain places, like Salt Lake City and Los Angeles, intergenerational transmission is smaller, meaning the chance for a child from a poor family to earn a high income as an adult is closer to that of a child from a wealthy family. Opportunity is more equal here. In other places, like Cincinnati and Memphis, intergenerational transmission is large, meaning the income of a child is highly dependent on the income of their parents. Opportunities are unequally distributed. My research examined this inequality of opportunity to understand why there is significant geographic variation in intergenerational transmission. What might cause geographic variation in mobility? One common hypothesis is that differences in public school quality drive variation across the country. Perhaps places like Salt Lake City and Los Angeles have better schools that deliver a high-quality education, giving children more equal opportunities to succeed. An alternative hypothesis is that differences in labor markets drive the variation in mobility. Perhaps factors like job opportunities or differences in pay contribute more to income variation than access to quality schools. My research compared the contributions of differences in education and the labor market between locations to intergenerational transmission of economic status. If variations in education and school quality drive the differences in mobility across the country, we would expect to see that areas with a strong association between intergenerational incomes also experience a close association between parental incomes and children’s educational achievements. This would imply that having parents with high incomes helps children do well in school, which allows them to earn higher incomes as adults. On the other hand, if differences in education are not the key link in intergenerational transmission, we would not expect to see a connection between educational success and future income. I used data from three panel surveys with a representative national sample and information about parental income and children’s achievement across different ages. Using the zip code of the child allows for geographical analysis. The Educational Longitudinal Study (ELS) surveyed children born in 1985-1986 at 10th grade, 12th grade, two years after high school, and eight years after at about 26. I measured high school math and reading assessment scores, college completion and educational attainment, non-cognitive skill measures and adult income at age 26. I also used data from the Early Childhood Longitudinal Study, Kindergarten Cohort and the High School Longitudinal Study to gather additional data on math and reading test scores. I found that access to high quality elementary and secondary schools is not a significant factor in determining the geographic variation of intergenerational transmission of economic status. There is variation across the country on the strength of the relationship of parental income and children’s educational outcomes, indicating that schools in some areas are more successful in helping children from poor families achieve at the same levels as children from wealthy families. However, the differences in educational outcomes are not linked to the differences in income transmission. Areas where the gap in test scores between poor and wealthy children is lower are not necessarily areas where the gap in incomes is lower. In fact, children’s skill accumulation accounts for only 11% of the variation in income transmission (see Figure 1). However, there is an association between the strength of income transmission and the return to education in a given area, indicating a key role of the labor market in influencing mobility. There are also important differences in earnings for those with similar skills, reflecting the influence of labor market institutions like unions, or differences in access to good jobs. This research indicates that almost half of the differences between high and low opportunity areas comes from labor market factors. 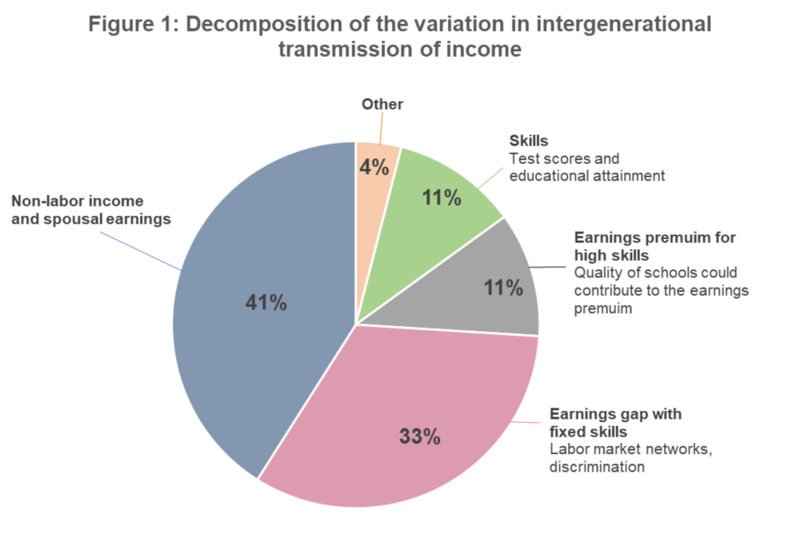 The decomposition of the variation in inter-generational transmission of income across areas of the United States for children born in the 1980s. Source: Jesse Rothstein and the Washington Center for Equitable Growth. My research indicates that policymakers wishing to advance equality of opportunity should examine structures of inequality in the labor market. Quality education is an important pathway to opportunity, but focusing on education is not enough if a quality education cannot offer a path to a high-quality job. As my research reveals, labor market institutions are key factors influencing the path to mobility. Important policy questions to consider include access to unions, discrimination in hiring and advancement, minimum wages, career structures of key institutions, and other mechanisms of earnings inequality.